In case you haven't heard, Seattle is one fabulous city. Aside from being the fictional residence of a certain Patrick "McDreamy" Dempsey, it is the home of the vibrant and deliciously gritty Pike Place Market. After going through the rigmarole of securing my work visa at the Korean Consulate yesterday morning, I spent the rest of the afternoon wandering around the Market--listening to some banjo-pickin' buskers, drooling over grapes the size of my head, and marveling at the unbelievable array of hippie handicrafts. Seahorse windchimes? Check. Crocheted rainbow booties? Check. Sanddollars engraved with pictures of seahorses and rainbow booties? Check. It's all here. The open stalls, the music, the wafting smells of donuts and handmade soap all contribute to this great feeling of community. Cluttered and colorful, the market is a needed antidote to the gloss and shine of the mega mallopolis stores just down the street. It was such a lovely way to spend my last couple of days in the red, white, and blue. * A note on the title of my blog. About 6 months ago I was looking for cool art websites online when I came upon this site for contemporary Korean artist Kimsooja. I loved her adoption of the concept of bottari. 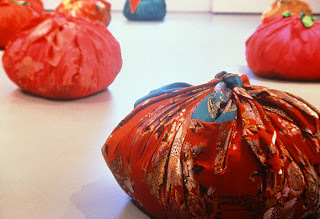 Bottari is a Korean word that refers to a bundle or container made from patterned cloth that is used specifically to transport a family's belongings when traveling to a new home. Kimsooja takes the literal application of the word and presents a metaphor, suggesting that our bodies are a type of bottari. She says "Our bodies are the most complicated bundle." I love this idea that the human body is an exquisite container housing our memories, impressions, and values as we journey through our lives. Like Kimsooja, I wanted to adopt the word by suggesting that this blog is yet another type of bottari--a container to hold my impressions, experiences, and surprises ('cause there's definitely going to be some of those) as I embark on my journey to South Korea.